Celebrating cats in 365 color photographs, this superbly illustrated book will appeal to all cat lovers. Each gorgeous photograph is paired with a quote for each day of the year. This is a perfect gift for a cat lover. 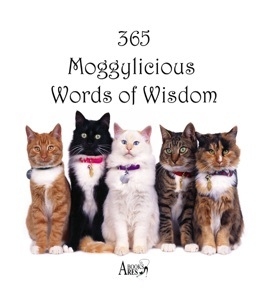 365 Moggylicious Words of Wisdom by Ares Books is a book full of quotes and sayings that is presented in a day-to-day calendar format. Each day of the year, you get to look at an adorable picture of the cutest cats and kittens that can possibly be found. You also get to read many quotes, sayings, and proverbs, some humorous and others inspiring, by the likes of Gandhi, Mother Teresa, Albert Einstein, Aristotle, among many others. Some you’ll have heard before, and others you’ll wish you knew long ago. Who wouldn’t enjoy a good quote with a cute kitten? As soon as you see the cover, you will be immediately drawn in. The unique, creative title and the five lovable cats instantly invite viewers into this fantastic book. Combining oh-so-cute photographs of cats and incredible quotes and sayings was a great idea. Every day for an entire year (and every year after, if you’re like me! ), you can enjoy an inspiring quote and a cuddly kitten. If you have ever had a cat, you will know how funny they can be and how they can just make your entire day when you come home to see its sweet face. Looking at this book reminded me of those days. This is a perfect gift for a cat lover. And if you’re a dog lover, this book will turn you into a fan of those awesome cats. I would definitely recommend this book to anyone. I dare you not to smile when you see these precious animals!